PV or Solar PhotoVoltaic, is the technology used to harvest sunlight and transform it directly into electricity. Solar power is clean, abundant and available to everyone, everywhere. At the starting point is PV… the harvesting of clean abundant electricity for the home. It is fair to say that PV technology is widely accepted as mature and economically viable (given current financial incentives). Due to the wide variation in these incentives at the state level, Solar activity can be booming in one state and languishing right next door. Unfortunately, PA is one such state where Solar has been languishing. Arguably, this has some basis in the fact that the state is preoccupied with fracking for gas. Regardless of this less than enthusiastic support for Solar, we feel that incorporating the value contributions for the EV and Smart Home components tip the economic scale back in our favor. Reduced Utility Bills… our area of focus is on the residential market where the economics are not quite as favorable as they are for businesses. 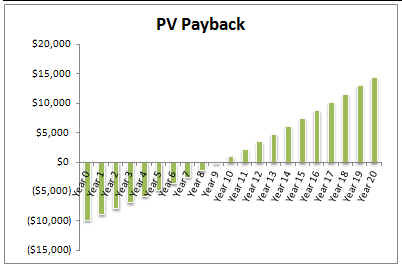 However, residential grid tied PV systems have fallen to the price point where many payback in several years due primarily to avoided electric costs. Can Solar be a money making proposition? It can be, if you have the up front capital to invest. But for many of us, the availability of significant up front capital is limited. Regardless, whether we pursue Solar as an investment or simply a way to reduce or utility bills, we can start down the road of clean, sustainable energy with little or no money down… sure sounds like a win-win situation to me. Potential to Power an Electric Vehicle (EV)… Solar can power more than just the existing electrical loads in your home. If the system is sized properly, it could potentially power an Electric Vehicle (EV) as well. Now you are offsetting more than just pennies per kilowatt of electricity, you are no longer spending hundreds of dollars per month for gasoline. Now we are talking material savings. Our sense is that EV’s could be a major selling point for Solar… we just need to get the EV ball rolling and help people “connect the dots”. Potential to Supply Emergency Power… Did you know that, if configured properly, a complete Solar system can be used to provide backup power to the home when the grid is down. This is what the residents of New Jersey were expecting after Superstorm Sandy rolled through and the sun finally reappeared. Unfortunately, they were surprised and quite upset by the fact that most Solar systems installed up to that point are not capable of providing backup power. We at EC, want to move beyond this limitation of today’s grid tied configuration. We want our customers to have power when the grid is down… whether the sun is out or not. The truth of the matter is Solar will work anywhere there is sunlight. It’s a matter of how much sunlight your location gets over the course of the year and designing the system size to accommodate that amount of sunlight. 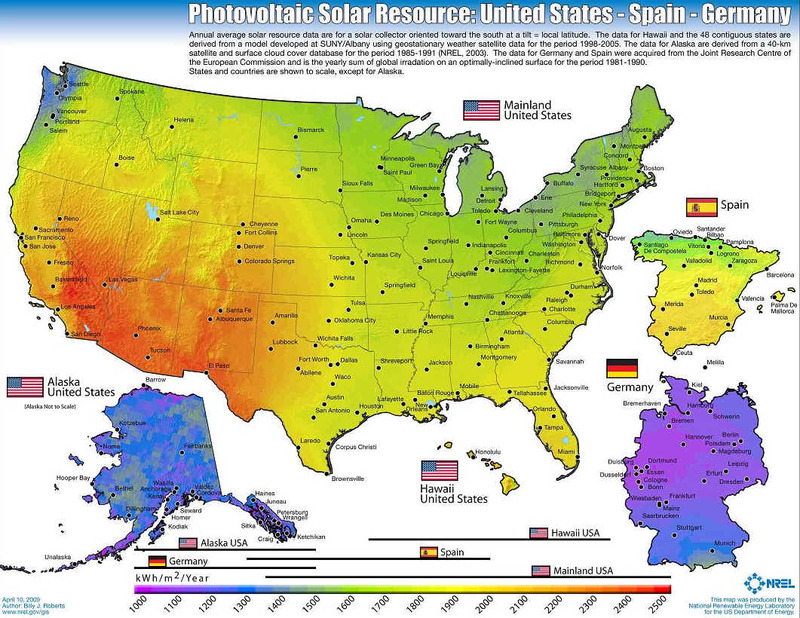 Germany is the leading solar market in the world and their Solar irradiance is less than the majority of the continental US as is evident in the graphic. It is true that after Superstorm Sandy, when the sun finally reappeared, virtually none of the Solar systems in the affected area produced any power… the grid was still down. The reason these undamaged systems were unable to generate power was due to the nature of the grid-tied design. As a safety measure, this design detects a loss of grid power and automatically shuts down to prevent Solar from back feeding and jeopardizing repair crews. The surprise and frustration of these Solar owners sent a strong signal thru the industry… we need Solar resilience. As a result, most of the major Solar vendors have been scrambling to come up with a configuration that can provide some level of backup power when the grid is down. We at EC have always been proponents of a more robust Solar configuration that includes backup power that can do more than simply charge your cell phones. The bottom line is that we are trying to clear obstacles to pursuing Solar and are making great progress. We hope to shift people to letting go of the negative spin and looking into Solar as a viable option for clean sustainable power today. We get this a lot. Recent data from the real estate industry shows that in mature Solar markets such as California, Solar homes have a higher resale value. Typically this additional value is proportionate to the remaining life of the system and it’s ability to continue to avoid electricity costs. So you either recover the system cost from your electricity savings while in the home or you resell the remaining solar production when you resell the house. 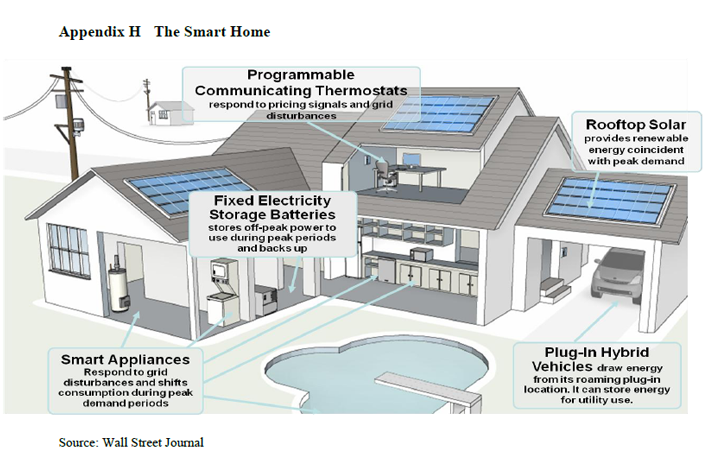 Although this smart home graphic is a complete configuration, we will highlight only those components pertinent to our discussion… Solar PV components. The simplest PV configuration is the grid-tied system that includes the Solar modules (either roofmount or ground mounted) and a simple grid-tied inverter (not shown in the diagram). The inverter changes the DC from the Solar modules to AC to be distributed thru the home or net metered back to the grid. 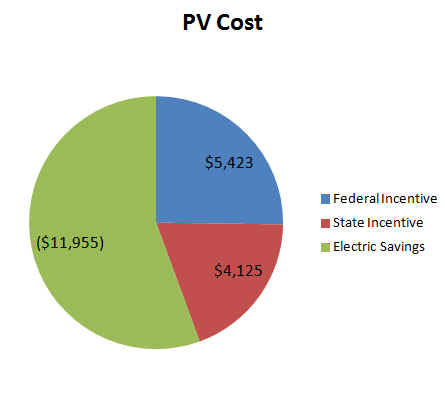 Net metering is where any excess Solar production (i.e. more electricity than the home needs at any point in time), is sent back to the grid which in essence “banks” this excess until the situation reverses (i.e. the sun goes down) and you retrieve that “banked” electricity. The key is that a standard grid-tied inverter will not run unless it senses power on the grid. There are newer, smarter inverters that can detect a grid outage and switch from grid power to local power which typically comes from Solar storage (i.e. batteries) but in some newer designs can simply come directly from your Solar array. Until recently, Solar storage batteries were typically for off grid systems and were the old lead acid variety. However, after Superstorm Sandy and the call for resilience, hybrid configurations that married grid-tied with local storage started to appear. At the same time batteries have begun to shift to the more expensive but much more capable lithium ion formats similar to what powers your computer and cell phone. typical balance of system components such as wiring, disconnects, etc. The overall cost would be under $20K and half of that cost would be covered by federal and state incentives. So less than $10K of the overall cost needs to be recovered by avoided electricity costs and SREC sales. SRECs are Solar Renewable Energy Credits that are issued for every 1000 kW of electricity you generate . These certificates are bought and sold somewhat like stocks and bonds. The only problem is that the SREC market in PA is virtually nonexistent with prices around $15 per certificate as opposed to $140 in NJ or $475 in DC. Given our scenario, payback would occur around year 8 with a 10 yr ROI of 5% and a 20 yr ROI of 12%… not bad for PA being a Solar wilderness. Obviously, these economics are better in the other states mentioned.